Giles Geastwas a mercer, living in Tewkesbury in the sixteenth century. He seems to have profited hugely from the sale of monastery property at the dissolution, and had a social conscience. 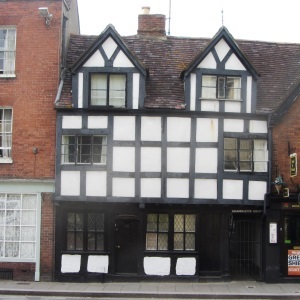 He left twenty two houses in trust for the benefit of the poor of Tewkesbury. This Trust is known as the Geast Charity. Its records were meticulously kept until it merged with other town charities in the nineteenth century. Three of these houses were in the alley which is now known as Wakeley’s Court, which is at the northern end of the Mill Bank. The Charity accounts give us an almost continuous record of the tenants and their rent from 1564, when William Moore, Edward Tayler and James Carre were paying 4 shillings each per annum for what were described as a ‘tenement or stable and garden’. The alley was then called ‘Waite Lane’. For a reason which is unexplained, its name changed to Car’s Lane in 1716, at a time when Samuel Merrell held the tenancy of all three properties, for a rent of thirty shillings per annum. The last record is for 1807, when Ann Stone was paying fifty two shillings, Thomas Allad thirty shillings and Thomas Literidge thirty seven and six. Rent was very variable, and there’s evidence that it was sometimes set according to ability to pay. The three tenements have, over the passage of time, been combined into one property. When and why the Wakeley name appeared isn’t clear. It is likely to be a family name from the middle of the nineteenth century. Nowadays, the name has dropped out of use; the houses are officially an extension of Mill Bank. The court terminates at the old Stonemason’s yard, where there is still a right of access, but only when the lower end of the court is flooded. 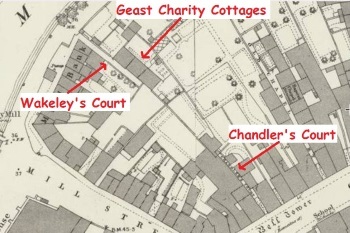 It has been suggested that at one time the court joined Chandler’s Court, off the High Street, to form an alley. If this was so, then there must have been some subsequent realignment of plot boundaries, because the two don’t line up, and didn’t on the earliest OS maps. The burgage plots on Church Street did not extend to Mill Bank. 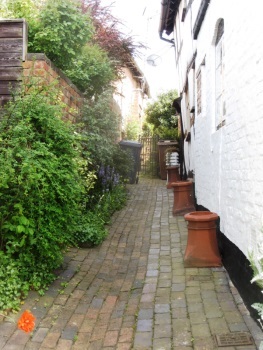 Whilst there may once have been a passage, an alley of the old Tewkesbury style seems unlikely. Chandler’s Court was not a busy place. There were only two cottages; the court being dominated by a malthouse. Daniel Chandler, who lived in the ‘front house’ and gave the court its name, was a maltster and corn merchant. He was best known, though, as a long-serving collector of the poor rates, which was probably as popular as a traffic warden today, and a Guardian of the Poor. He was first elected in 1846. When he died in 1905, he was the town’s second oldest resident, at 91 years (exceeded only by John Rogers, whose notes on Tewkesbury’s alleys are so useful today. He was 97 at the time). The notice of his funeral claims for him the distinction of being the last person to be buried in the Abbey churchyard. Today, Walkeley’s and Chandler’s courts are quiet private areas which cannot be explored. Their entrances, though are attractive, and ancient, features of the streetscape.